Get affordable Security Camera installation on Santa Fe Springs, CA and CCTV equipment with commercial quality and 2 years warranty. We have been working on Santa Fe Springs since 2005; we provide high quality security camera installations. 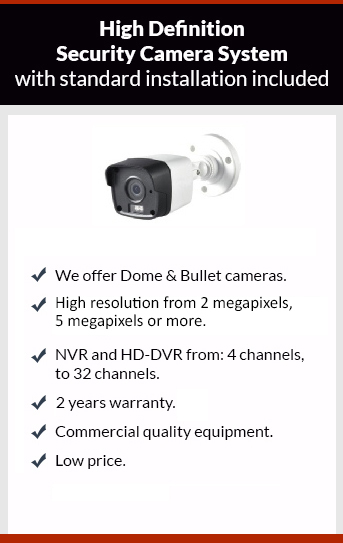 The equipment that we install has commercial grade quality, and we offer the best price in the market.. One of the most important specifications in the security camera is the resolution. The resolution is the amount of detail that the camera can capture. In the old analog security camera the measure of the resolution was on the number of horizontal TV lines. The range of this resolution was from 380 TV lines to 700 TV lines, the picture of the security camera was not really clear. Recently with the new technologies the resolution of the cameras is measure in megapixels. The range of resolution of this cameras goes from 1 megapixel, 2 megapixel (1080p), 3 megapixel, 4 megapixel (4K resolution), up to 5 megapixels. The clarity of picture of these cameras is amazing. To get 2 megapixels security camera system is easy and cheap because is the new standard. The retail stores are full of this kind of systems; you can buy them for a few hundred dollars. The customer can install the system by himself, or get help for a CCTV installer. When you buy a system from a retail store “you get what you pay for”, If you do not pay much money for something, it is probably of poor quality. In the long run you have to replace cameras or the complete security camera system, through time this kind of system will become expensive. Protection4less offers you high quality security camera systems with professional installation included. We offer 2 years warranty on the equipment and installation, you’ll be sure that if you buy from us, you took the right decision. The proposals of Protection4Less are detailed and included: Description of the job, camera map, insurance, references, specifications of the equipment, and a description of the cost. There is no hidden cost. We don’t charge monthly fees.